6.50 points at 10 votes (rank 507). 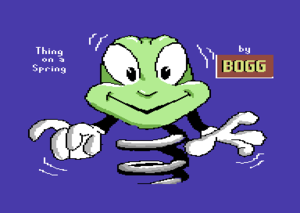 The evil goblin is disastrous for the innocent world, he does magic and bans their treasures into his underground factory deep in the earth's entrails. Fill the magical puzzle and break the devilish ban. Our hero has infiltrated the goblin factory. He does not know what to expect or where to go. Everything he knows is, that he has to collect 9 puzzle pieces. Added together, he will get a notion about how the devilish goblin can be eliminated. He has set many traps and warned his guards and ghouls that an unwelcome vistor could be soon amidst of them. Everything that THING needs is oil for his spring; this can be found in the factory komplex. But beware, the ghouls and guards cause corrosion and rust. The goblin has wrapped 5 switches. With this you control the gadgets, that you have to use to explore the whole complex and ensure the goblin's downfall. 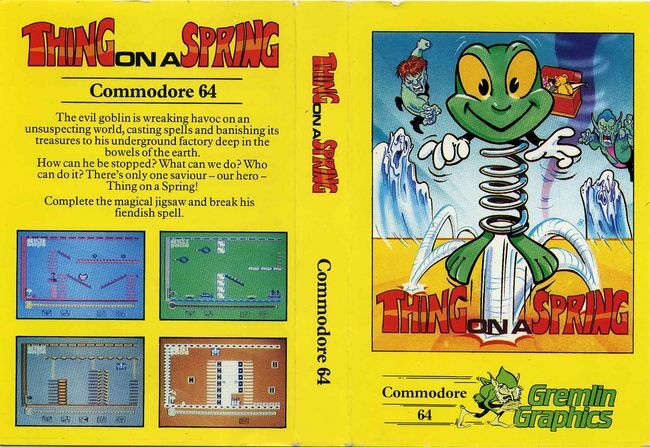 THING ON A SPRING is a sideway scrolling platformer and has an elastic spring that can do somersaults as a main character. The oil-level represents the life energy. When all the oil is used up by touching the enemies or by time factor, the spring will dissolve. The corridor at the start. At the upper left the position of the lift is shown with which you can change the level. You may be able to estimate the "waiting time" until you can change to another level, but basically, the position is not really important for the course of the game. The oil can fills of the oil-level. The packed switch activates gadgets. In the lift screen, press the space key Space or the fire button , to stop the uplift. Navigate to the right, if you want to get off. First of all: This solution does not correspond 100% to the longplay linked below, as the puzzle pieces were at different places. On the first level there is a lift shaft and four rooms (in this article named A-D from the lift view), which are all connected by corridors. But at the start you have to collect the switches in the right order to be able to cross the rooms. So at first after the start you go to the left and enter the room "Level 1-B" (red walls), cross it to the wrapped switch which makes the moving stairs useable and leave it again to the right to where you have started. Unfortunately, you have to partially jump or run pixel exact already at this early point, amongst others to carry away the complete wall of fragile stones to the right of the switch paket, which makes the entrance into the game very thorny. 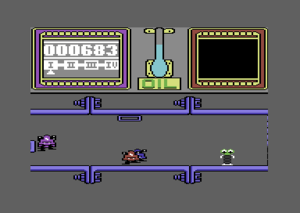 Then you cross the corridor to the right and enter room "Level 1-C" (brown background), go up the moving stairs, jump down on the other side and grab the rocket-switch-paket by walking below the second moving stairs in a ducked position. Then take the second moving stairs to the upper top, back into the direction of the entrance and jump down. Directly next to the place where you have originally entered the room is now a "mini rocket launch ramp" that we can trigger and which catapults us to the ceiling and enables us to comfortably cross the level to the right. During this we collect an oil can and a puzzle piece. And now all the way back to room 1-B ("red"), to leave it this time to the left. 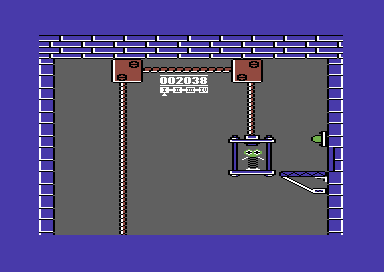 This room is a bit unfair, as you have to necessarily jump off the conveyor belt before it ends to successfully jump over the dissolving stones and collect the trampoline switch at the far left. If you have made it to leave the room to the left, there is only one single corridor which separates you from the lift that gets you to the next level, if you press fire or space while waiting and navigating to the right at the desired level. On the "way there" you only have to stay at the top and collect the last switch. This makes sure that certain electric defensive rays are "quasi magnetically" rejected and you can walk over electric power... You can collect the oil later on the way back if you dare to. This room is 20% bigger than the three smaller ones on level 1 but smaller than the following which is again as big as the biggest one on level 1. From now it gets unclear: the exits are often not at the same place any more where they were when you entered the room. As in the previous room, you can keep at the top on the way there if your dare to go the way back, as the room can only be left by the teleport at the left of the oil. To leave the room to the right you have to go where the second Thing is placed in the right quarter of the room. For a change this is a level in which you mainly have to avoid perils with the correct timing without jumping in a complicated manner. Only the conveyor belts to the oil can need a combination of jumps which is not easy to learn. FXXS: "Cute Jump&Run, which unfortuantely ends in dead ends too often, because the player has jumped one pixel off... But I also ask myself why the ghosts move independently from the room... 7 points." This page was last modified on 22 February 2019, at 18:24.